"A recording by Ing. Victor Gonzalez in Tepexpan (Mexico State). The witness states that the was walking along the street when he became aware of a very strange glow in the sky. He was unable to stop for a look, as he had to pick up his son from school. "Later,he took the boy to his mother-in-law's house, as he does every day, and returned to his workship. To his surprise, the object remained in the same spot. He then notified his father to set up a telescope (Polarex 75mm). "He made a recording through his telescope on Monday, November 9, 2009 at 14:30 hours. 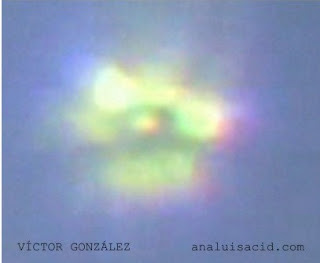 Victor claims that the object remained visible for an hour -- between 2 to 3 in the afternoon. "At this site, the same witness has recorded an alleged UFO the previous week."